I don't watch a lot of movies; I really don't know why. I guess I'm just afraid of commitment, afraid of committing myself to sitting still for two and half hours. But I did sit through one the other night and it was excellent: Wes Anderson's Grand Budapest Hotel. It's a sort of double flashback, a flashback inside of a flashback. It's a comedy, but not an example of realism. There is quite a bit of non-versimile nonsense, but it doesn't fall into the traps that other non-realistic movies do (I'm looking at you, Pan's Labyrinth). One of my favorite things was the way that Ralph Fiennes' character, Monsieur Gustave, would combine this affected diction with straightforward, obscenity-laced talk. Highly recommended, if you have yet to see it. Worth sitting a couple of hours for. 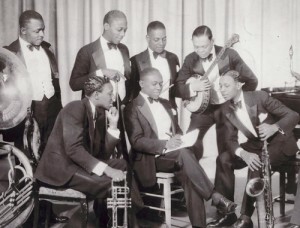 Jelly Roll Morton explained Luis Russell and New Orleans riffs to us. "Call of the Freaks." Here come the garbage man." Jim Dandy and Nico/Gaby tie for the win in the cover contest this week, with Mary Ellen one point behind. 1. What's the name of the tune that Akiko Tsuruga is playing, and who had a hit with it back in the day? - "I won't Last a Day without You" / The Carpenters. 2. Two Tons of Steel did a countrified version of a tune ... whose? - "I Wanna be Sedated" by the Ramones. 4. We heard Joshua Redman cover a tune. What's the title and whose tune is it? - "The Crunge," by Led Zeppelin. Where is that confounded bridge, anyway. Mary Ellen, had you gotten the title, you would have tied for the win! Although since you are gonna score me some dry sherry, I'll make you an honorary winner. Catamount Community Radio, Sunday mornings 10-12 on WWCU-FM. Fall back next week an hour, so I may sleep in a little bit. See you then! 22. Dr. Octagon – Got Any Kids? 25. Allison Krauss & James Taylor – How’s the World Treating You? I wouldn't be kickity-kick-kick-kicking myself for missing that one.